On Saturday, Dec. 20, 2014, a protest organized by Black Lives Matter Minneapolis aiming to shut down the Mall of America took place. The demonstration was part of the ongoing movement against police brutality and structural racism in police departments nationwide. Thousands of protesters crowded into the rotunda of the largest shopping mall in North America with banners proclaiming solidarity with Ferguson and “black lives matter.” Chants of “Hands up, don't shoot!” and “No justice, no peace, no racist police!” echoed through the mall and sometimes got loud enough to shake the windows. Protesters who showed up a little late were greeted by members of the Bloomington Police Department dressed in head-to-toe riot gear and plainclothes mall security guards. Several members of the Twin Cities IWW were present and a few were arrested when they tried to break through these police lines set up to block protesters’ access to the rotunda and the other half of the mall. An entire section of the mall was entirely shut down, with all the shops closed. Many food court workers walked off their jobs and stood with their hands up while still wearing their Auntie Anne’s Pretzels or Dairy Queen uniforms. 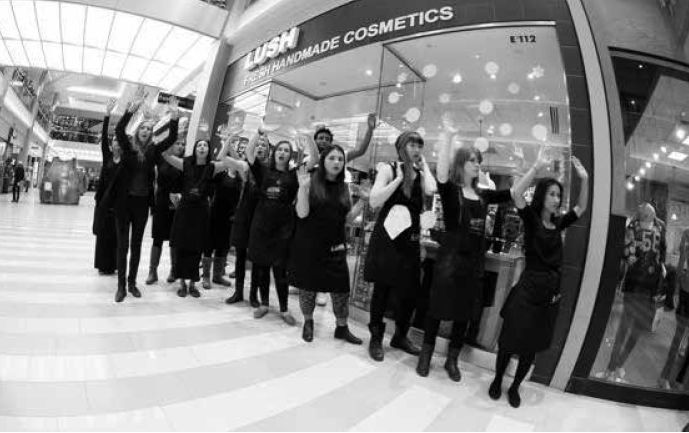 Employees at the animal-friendly cosmetics shop, Lush, stood outside their store with their hands up in solidarity with the protesters. Many employees who were trapped inside their shops by the barricades that mall security guards set up stood by the shop windows looking out at the protests and raised their fists in support. For a few hours, the Mall of America was partially shut down and the people who worked there seemed totally fine with it, and even supportive in some cases. Whether or not food court workers who abandoned their posts and joined the protest could be called a “wildcat strike” is up for debate, but it certainly speaks volumes that this is an issue that resonates with so many. It resonates enough with people that they are willing to refuse to work and instead take action against a white supremacist police state. Previous Black Lives Matter demonstrations in the Minneapolis-St. Paul area have linked the Service Employee International Union’s (SEIU’s) Fight for 15 and Fast Food Forward campaigns with the movement against police violence. McDonald’s workers, still in their uniforms, blocked highways and led chants of “Hands up, don’t shoot.” Some of them participated in die-ins on the highway or in the middle of busy intersections. The fact that many people of color who experience the brunt of police violence also make up a considerable amount of those who work at low-wage fast food and service jobs speaks volumes about the white supremacist capitalist system that we find ourselves living in today. It is the hope of this Wobbly and many others within the general antipolice movement gaining traction that we can link direct action against bosses who exploit us for our labor and pay us menial compensation with direct action against a State which uses violence to enforce a white supremacist and patriarchal social order. Actions like “Hands Up Don’t Ship” (a symbolic protest by rank-and-file workers at the United Parcel Service [UPS] hub in Minneapolis in which workers refused to ship packages from Law Enforcement Targets Inc.) and these spontaneous walkouts by food court workers at the Mall of America are just the beginning of what is hopefully a new movement: a movement which can begin to combat both the mistreatment at the hands of the employing class and the mistreatment at the hands of the police; a movement that can bring working-class people together regardless of race, gender, or sexual orientation and fight for its emancipation. The Twitter personality “@zellie,” who has been extremely active in reporting what has been going on in Ferguson and also in New York in response to the murders of Mike Brown and Eric Garner, said “If you ever wondered what you would be doing in the Civil Rights Movement, now is the time to find out.” Let us all find out together. In the face of such blatant disregard for the lives of people of color in this nation by the police, inaction on our part is complacence. The labor movement of the 21st century cannot avoid the presence of white supremacy or patriarchy in our society. It must combat them as well as combat capitalism. Then and only then will we begin to see a much less miserable world, one in which all of us will be free to carve out our own destinies free from the confines of wage labor, patriarchal subjugation, and white supremacist marginalization. Wobblies of the world, let’s get to work!